I've said it before and I'll say it again: Learning new things is my favorite part about reading. This book opened my eyes to the events in Japan both before and after WWII. 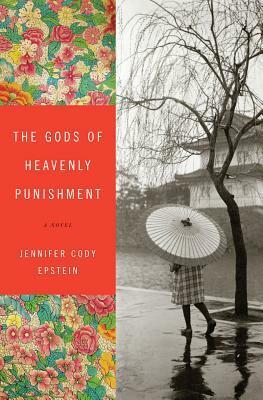 The Gods of Heavenly Punishment is told from the point of view of a young Japanese girl, certainly like nothing I've read before. The characters lives are interconnected in interesting, yet plausible, ways. The men and women that people this story are convincing and genuine. Days after reading this I can't stop thinking of them. This book offers an unflinching look at the horrors of war. You'll find yourself holding your breath during the firebombing of Tokyo. Cody Epstein doesn't focus on the atrocities as much as on the relationships between people devastated by the events. Ambitious and breathtaking, The Gods of Heavenly Punishment is not to be missed. To connect with Jennifer, “like” her on Facebook. To visit the other stops on this tour please visit TLC Book Tours. I love it when fictional novels open my eyes to a part of history I know little about. This is definitely going on my list! Me too Kelly, it's my favorite. I hope you find time for this one! Me three, adding this to the TBR pile! Woot woot! I'm glad to hear it Monika! This one looks really good. Thanks for the heads up! I'm gonna be reading this in a couple of days and I can't wait! I hope you enjoy it Claire :) Thanks for visiting! I'm taking part in a blog tour for this book too, I was excited about it as soon as I got the email and I'm even more excited now! Oh good! I hope you really like it Sam! Learning is my favourite part of reading too, so for you saying that about this book, and the book sounding good anyway, I'll have to look into getting a copy. Great Charlie, I hope you do! you too with this book? I knew I missed out on a good one. Heart wrenching but an important aspect of history that should be explored. I've seen The Gods of Heavenly Punishment around blogland and it sounds like a good one. Learning while reading is the best :) I love a book that leaves you thinking about it long after you've finished reading. Great post! Thanks Naida~ I didn't know nearly enough about Japan during WWII. I tend to read more about things from the American side of that war. I think I would love this. I've read quite a few war-driven historical fiction this year. I always find it an eye-opener. Seriously, I just love books about other cultures! Adding this one to my list! Learning new things, especially about other cultures, is one of my favorite parts about reading, too! This book sounds right up my alley, Jennifer! If those are your things you will adore this book :) Thanks for visiting! There are so many books about Europe during WWII. It's always nice to see a book that give us a different part of the story! I LOVE learning from my historical fiction! It's part of the reason it's among my favorite genres :). Sounds like a good one! Oh my, that fire bombing part was so well written, but the whole book really was. I'm looking forward to reading more of Epstein's work. Wasn't it?? :D She has another book out, The Painter from Shanghai. I'm going to have to read that too. I almost picked this book form NetGalley to read. Sounds like I should have. I'm like you in that I love to learn while reading! I'm like you - I LOVE learning while a read. I think I'll enjoy learning from this book! I'm sure you will! :) You're very welcome!